Meet Rep. Joe Courtney: Security Risk! You are here: Home / *Articles of the Bound* / Meet Rep. Joe Courtney: Security Risk! Is a close association with the Communist Party USA compatible with service on the House Armed Services Committee? Should a congressman charged with overseeing some of America’s most valuable defense capabilities be mixing with members of a political organization closely allied with some of America’s most dangerous enemies? If the answer is “No,” then Rep. Joe Courtney, D, Conn., should have to answer some questions. 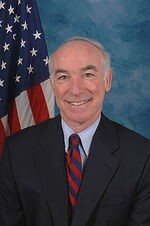 Congressman Courtney is a high-powered member of the House Armed Services Committee. Should a man charged with such key responsibilities be in any way involved with communist organizations? Many readers have likely experienced some form of grueling “security clearance” procedure, which continues to be required for many federal government positions. A known association with a subversive organization would normally result in the denial of a security clearance – so why is this not a problem for Rep. Joe Courtney? Fortunately for many on Capitol Hill, members of Congress require no security clearance whatsoever to serve on the most critical and sensitive congressional committees. Not the Intelligence Committee, not the Homeland Security Committee and certainly not the Armed Services Committee. All senior military officers are security checked, but the elected officials who oversee them require nothing. Zero. Zip. Enemies of America are undoubtedly aware of and exploiting this “loophole.” The most powerful legislators in the world, with access to sensitive information and the ability to influence national and international policy at the highest levels, have ZERO security scrutiny. 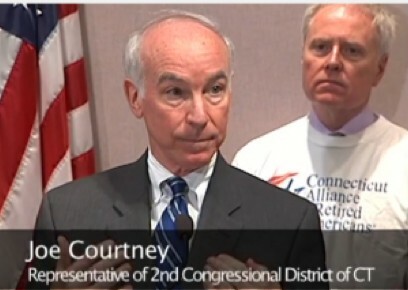 For several years, Rep. Courtney has worked closely with the Connecticut Alliance for Retired Americans (CARA), a known and established front for the Communist Party USA. 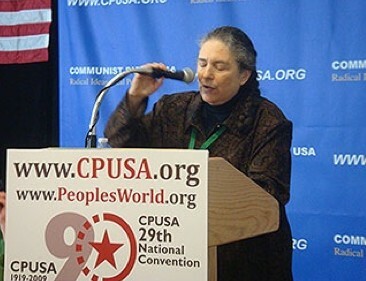 Based at the Connecticut Communist Party USA’s headquarters at 37 Howe Street, New Haven, CARA is run by well-known Communist Party USA cadres like Joelle Fishman, her mother Edie Fishman, Win Heimer and Tom Connolly. Art Perlo, Joelle Fishman’s husband, is also involved. He serves on the Communist Party USA’s “Economics Commission” just like his father before him, lifelong party member and Roosevelt administration Soviet spy-ring leader Victor Perlo. CARA, along with the Communist Party USA-infiltrated “Connecticut Working Families Party,” has endorsed Joe Courtney every two years since 2008. Rep. Courtney has attended many CARA events over several years. 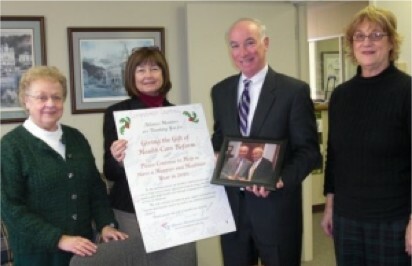 CARA presentation to Rep. Joe Courtney, Dec. 21, 2009. Joe Courtney with CARA member and Communist Party supporter Kevin Lynch, April 2011. Rep. Courtney does not shy away from contact with CARA, even though he almost certainly knows it is Communist-controlled. 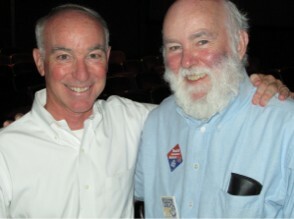 Rep. Courtney with Tom Connolly, CARA official and Hartford Communist Party leader, September 2009. Rep. Courtney certainly does not shy away from these people, although they are well known locally as Communist Party members and supporters. CARA leaders Win Heimer, left and Tom Connolly right, Communist Party rally, May 2017. Joelle Fishman, CARA leader, at Communist Party convention. Those who might dismiss today’s Communist Party USA, as a harmless shadow of its former self would be very much mistaken. The 5,000-member-strong party maintains strong ties to China, Cuba, Venezuela and Vietnam. 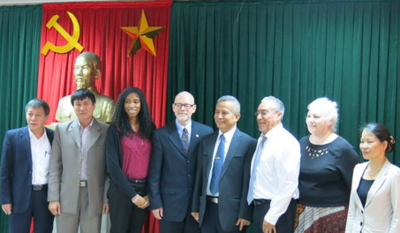 Communist Party USA delegation to Vietnam, 2016. 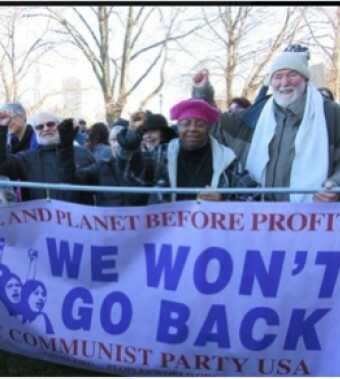 Even more disturbingly, the Communist Party USA is closely connected to the Communist Party of the Russian Federation, Russia’s second-largest political party, which is very much in sync with Vladimir Putin on foreign-policy issues that are staunchly anti-American. The Connecticut branch of the Communist Party USA has a route to Moscow through Al Marder, a local member since at least 1952. Marder is a leading official of the still highly influential World Peace Council, once the Soviet Union’s largest and most important international front organization. He is a regular guest at high-level international communist gatherings. 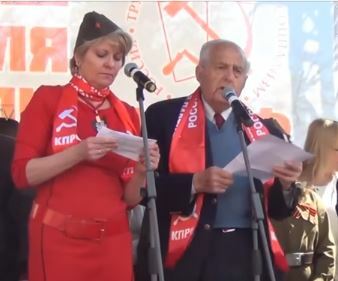 In June 2015, Al Marder, a World War II veteran, was in Moscow helping to celebrate the 70th anniversary of the “Victory over Fascism.” In between meetings and radio interviews, Marder addressed a large Communist Party of the Russian Federation rally in downtown Moscow. Al Marder with Russian communist interpreter. At the rally’s end, a fellow speaker was so moved, he came forward to embrace comrade Marder with a heartfelt hug. That “hugger” was none other than Gennady Zyuganov, leader of the Russian Communist Party. Al Marder and Russian Communist leader Zyuganov. There are but a few degrees of separation between Rep. Joe Courtney and the leadership of the most dangerous military power currently opposing the United States. At the very least, Rep. Courtney is guilty of extremely poor judgment. Would a low-ranking military officer be awarded a security clearance for higher office if he had similar connections to an anti-American subversive organization? Given the well-known track record of Communist Party USA espionage and the aggressive methods used by Russian military intelligence to entangle those it wants to suborn, should America take any more risks with Joe Courtney? America’s national security is too important to treat so lightly. Rep. Courtney should be asked to explain himself. Or he should resign from the Armed Services Committee – and Congress – immediately.